One of the primary reasons people use the Internet is to find out about events going on in the world around them. And, these days, if an event isn’t mentioned online, it may as well not even be taking place. Thankfully, if you or your business have events that you’d like to promote, there’s no shortage of tools designed to help you do so. 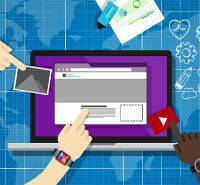 But if you’re on a budget, or have limited expertise when it comes to promoting events online, knowing where to get started can be a bit of a challenge. With that in mind, here are some of the most popular–and free–options for online event management. Hopefully this will ease your decision-making efforts when it comes to promoting your events online. Back in 2006, not long after introducing Gmail and Maps, Internet giant Google decided to get into the calendar game with a free online event management tool. And although Google Calendar has come a long way since then, it’s still primarily used as a productivity tool, rather than an event promotion platform. But that’s not to say that GCal, as it’s often referred to by those who use it, isn’t beneficial for sharing events. One of Google Calendar’s greatest strengths is its versatility and ever-expanding feature set. So while it may lack some of the social features offered by its alternatives, Google does makes it pretty painless to create an event calendar for your website that can easily be added to any page in just a few minutes. The embedded Google Calendar can display any event details that you wish to include, as well as provide viewers with a link where they can learn more or register to attend. One front that GCal falls behind in, however, is allowing the public to RSVP for your event. If that’s a must-have feature for you, you may wish to consider one of these other options. Spreading the word about upcoming events is one of the strongest aspects of social media. And although there‘s an abundance of social media platforms out there, chances are that Facebook is the one that will help you reach the most people. By creating an event on Facebook, you can allow your friends (or those who Like your Page) to easily RSVP for your event, and hopefully share the event with their own network of Facebook friends. There are a few downsides, though. Despite the fact that there are over a billion people on Facebook, that’s still not even half the number of people who access email on a daily basis. Also missing from the Facebook experience is the ability to create an event calendar widget for a website. So unless you’re specifically inviting Facebook users to your event, another option might be better for you. If you don’t have a website, but do have a list of your desired attendees’ email addresses, Eventbrite might be just what you’re looking for. Eventbrite works by allowing users to create attractive invitations that are then emailed to their guest list along with an intuitive RSVP system. Depending upon your settings, you can allow your event attendees to see who else is coming and to invite guests of their own. 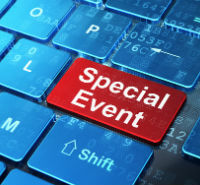 Plus, Eventbrite offers ways to create a website event calendar that can encourage site visitors to RSVP for your events. Eventbrite offers its users all of this functionality, as well as many more features, at no charge. Unless, that is, you’re charging a fee to attend your event. If that’s the case, Eventbrite will want its cut of each ticket sold, which can add up quickly depending upon the cost of admission. Now that you know some of the best ways to get the word out about your upcoming event, take some action and use one—or all—of these services at absolutely no cost. Or, if you want a larger Web presence for your event, you can use an event website builder to create a custom site in minutes. 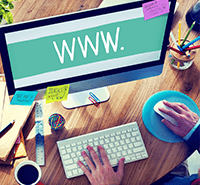 Learn how to create a free website using some of the most popular tools available. After you’ve learned how to make a free website, start promoting your events online with one of these free-to-use tools.